Randy Moss came out this week in New Orleans and said he’s the NFL’s best wide receiver ever. The 49ers wide receiver stood by his words again the next day. Another guy named Jerry Rice might have something to say about that. In the end, maybe it’s neither. Tweeted a question to Lions wide receiver Nate Burleson, who played with Moss at Minnesota, to get his take. 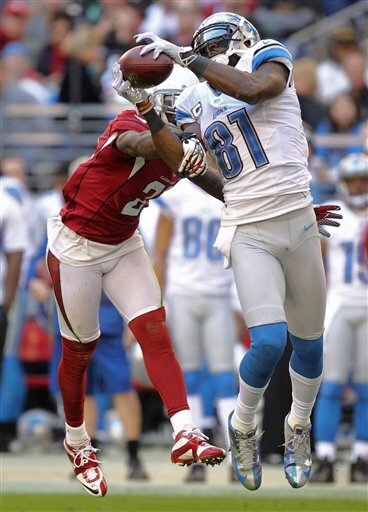 As you might guess, Big Play CJ is Calvin Johnson, Burleson’s teammate for the past three years. Johnson broke Rice’s single-season receiving yards record this season. And he’s far from done — he’s just 27. 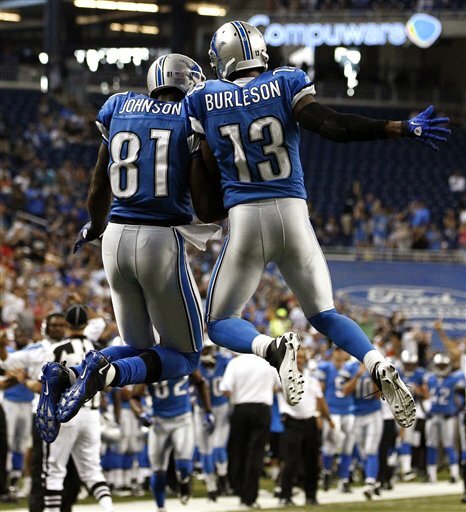 Burleson has used every adjective imaginable to describe Calvin Johnson since he first arrived in Detroit. It is not all about numbers, but here’s a look anyway. Rice finished with 1,549 catches for 22,895 yards and 197 touchdowns in 20 seasons. Moss has 982 catches for 15,292 yards and 156 touchdowns in 16 seasons and he’s not done. Johnson has 488 catches for 7,836 yards and 54 touchdowns in six seasons and he’s far from done. We won’t know the answer for several years, but I wouldn’t bet against Calvin Johnson who forces opponents to create defenses specifically to shut him down. And, he still sets records. Over the years Lions fans have learned to adapt to life during Super Bowl week — you know reading about the other teams preparing to play for the ultimate prize. Ran across interesting numbers this week involving teams with the most NFL championships. Here’s the list: Packers (13); Bears (9); Giants (8); Steelers (6); 49ers, Cowboys and Redskins (5) and Lions, Browns and Colts (4). Of course, the last Lions’ championship was in 1957 when they smoked the Cleveland Browns 59-14. The others were in 1935 (they beat the Giants 26-7), 1952 (beat Browns 17-7) and 1953 (beat Browns again 17-16). In that 1953 championship Browns quarterback Otto Graham had nightmare of a game finishing 2-15 for 4 yards. Describe nightmare? His fumble in first quarter set up a Lions touchdown and an interception set up a field goal. I’m thinking the Lions must have had quite a defense in those years. In that game they also had quarterback Bobby Layne. Many Lions’ fans have the same dream — to see the Lions win a Super Bowl. Certainly it might depend on their longevity. Will it happen? In today’s NFL, turn-arounds can happen quickly which means the dream never dies. If it’s any satisfaction, the Lions have more NFL championships than the Patriots who have three. The Detroit Lions have hired Brian Xanders, who has served as the Denver Broncos general manager for three seasons (2009-2011). Xanders, who has 18-plus years of NFL experience in Denver and Atlanta, will come to Detroit as the senior personnel executive. A statement was released by the team from Mayhew: “Brian’s addition, given his diverse background, positively impacts all aspects of our team's football operations. He brings experience as a general manager and has worked in both pro and college scouting. In addition to his personnel background, he has experience in contract negotiations and expertise in the development and use of technological resources in player personnel. In 2009 Xanders was the youngest NFL general manager at the age of 37. While he was with the Broncos, Denver claimed the 2011 NFC West Division title. From 2009-11, the Broncos acquired 25 players through the draft and free agency that ended the 2011 season on the active or reserve roster. Xanders left the Broncos with a year left on his contract a year after John Elway took charge. It happened after the 2012 draft and was a mutual decision according to reports. Like Mayhew, Xanders played at Florida State, but their paths didn’t cross. 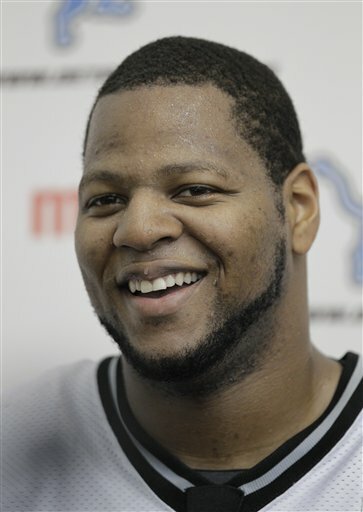 Ndamukong Suh saves rotund comedian Louis Anderson in pool mishap. (A sentence I never thought I’d write). It happened during a taping of “Splash” ABC’s new reality celebrity diving show, according to TMZ. Suh and Anderson are both contestants. Anderson was practicing his diving for the show and got so exhausted he couldn’t get himself up the ladder. He kept falling backward into the water, according to the report. Suh, the Detroit Lions defensive tackle, and divemaster Greg Louganis (former Olympian) had to lift him to poolside where he choked up some pool water, but was fine and plans to continue on with the show. Other contestants include Miss Alabama Katherine Webb (girlfriend of Alabama quarterback A.J. McCarron) and Kareem Abdul-Jabbar (apparently desperate for any kind of publicity). This is just such an odd premise, I might have to peak at it out of curiosity. First episode is set to air in March. Suh, who played in the Pro Bowl on Sunday night, didn’t have permission of the Lions to participate even though it’s a dangerous sport. Coach Jim Schwartz didn’t seem too upset about it when talking to reporters last week. You hold the key to predicting the outcome of the Super Bowl with this interactive chart by Digital First Media. You can weight categories such as points for, points against, pass offense, pass defense and six others between the San Francisco 49ers and the Baltimore Ravens. It’s so easy I can do it and it’s fun to boot. It’s free and something you won’t see from another web site. The Oakland Press falls under the Digital First Media umbrella. 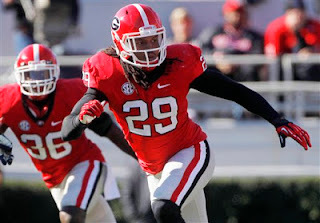 Detroit Lions draft: Is Georgia's Jarvis Jones the guy? So far the consensus from the two big dog draftniks is that the Lions will take outside linebacker Jarvis Jones with their No. 5 overall pick at the NFL draft. Sports Illustrated’s Don Banks and ESPN’s Mel Kiper project Jones as the Lions first-round pick. Jones is a pass rusher, the Lions need a pass rusher. Kiper sees him playing a role similar to that of Von Miller with the Broncos. Miller, who played at Texas A&M, has 30 sacks in his first two seasons — 18.5 of them in 2012. Both are the same size — 6-foot-3 and about 240 pounds. Jones played at Georgia. His spinal stenosis during his freshman season at USC remains a concern. It’s way too early to know anything for certain. The draft opens three months from today. 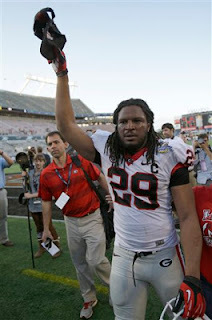 But it’s interesting to see that Jarvis Jones seems to fit the Lions needs — at least from the outsiders’ perspectives. — Jim Schwartz doesn’t seem concerned that Ndamukong Suh will risk injury when he participates in ABC’s new reality show “Celebrity Diving.” I don’t know. Diving isn’t exactly croquet. Not sure how experienced the big guy is in this endeavor. Wonder what his teammates think. 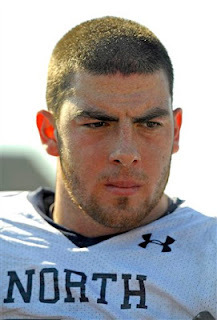 — Central Michigan offensive lineman Eric Fisher (see photo) has seen his stock rise this week during Senior Bowl practice. There’s a chance he could be the first offensive lineman drafted. Will the Lions jump at him? Can’t imagine that they would. Of course, who saw them drafting Riley Reiff in the first round. — To clear up a little confusion about the Lions draft picks, they have six. They have no fourth-round pick because they sent it to the Vikings during the draft last year so they could select Tahir Whitehead. Yes, wide receiver MIke Thomas cost a fifth-round pick, but it’s in 2014. So at this point they have six picks starting with the fifth overall pick. — Also, the teams who are done for the season (all but the 49ers and Ravens) have their rosters frozen until the day after the Super Bowl which is Feb. 4 this year. If teams want to make cuts they have to wait until that day to make it official. — Does anyone think Titus Young will return to the Lions next season? I thought there was a small chance until he tweeted this week that if he doesn’t get the ball more he doesn’t want to play. Haven’t heard that line since sixth grade. Titus Demetrious Young just doesn’t get it. Despite his immature antics in the past season, Jim Schwartz and Martin Mayhew had both said that a window was still open for the wide receiver to be on the 2013 Detroit Lions roster. That may have changed now. Young took to Twitter today and in doing so, he may have killed his career. Young was sent home following the Nov. 18 loss to the Packers when he lined up in the wrong spots more than once. He made it look like Matthew Stafford was throwing to ghosts. Young didn’t make it back on the field for the rest of the season. It wasn’t a first-time offense. Last May he sucker-punched teammate Louis Delmas and also then was sent home for a week. Wide receiver Nate Burleson nailed the situation after the season when he said that with the Lions, Calvin Johnson is the man — he compared him to Michael Jackson — and the rest of the wide receivers are basically backup singers. Young can’t seem to get that through his skull. Too bad for the second-round pick. If he would grow up and listen to Burleson, maybe he could have resurrected his career. Instead he shot himself in the foot. Obviously he has no grasp of the situation. Before today, thought he had a slim chance of rejoining the Lions. Now? He must be gone. That’s not a misprint, it’s diving not driving. The story is complete with a photo of Suh wearing blue plaid shorts walking around a pool with the Hollywood Hills in the background and bikini-clad Katherine Webb on his left. Looks like Miss Alabama, who is also the girlfriend of Alabama quarterback A.J. McCarron, is cashing in on her celebrity status such as it is. 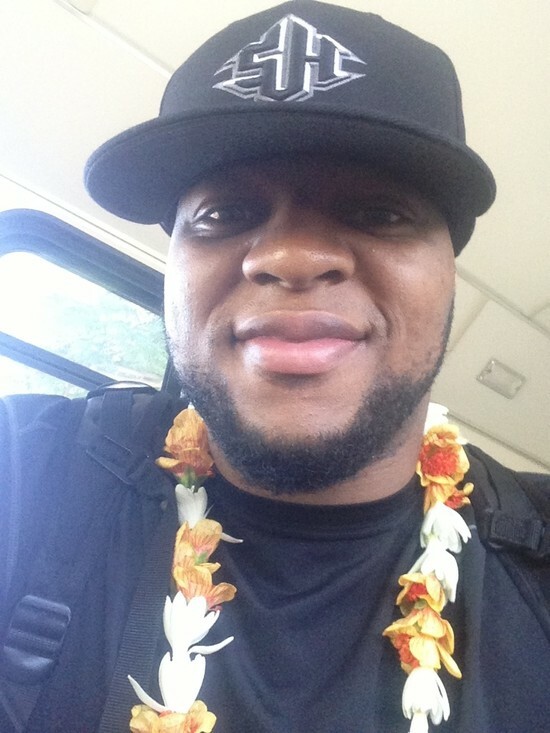 Not sure if this will conflict with Suh’s trip to the Pro Bowl. He made the roster as an alternate. The game is Sunday night in Hawaii. TMZ reports: “Ndamukong Suh is also a pretty shocking addition to the cast — considering he's in the middle of a huge contract and NFL coaches don't usually love it when a star player risks his health by jumping off a high dive. Again, those were TMZ’s words. Is there a belly-flopping clause in his contract? He’ll make $11.15 million in 2013. Other contestants include Kareem Abdul-Jabbar, Keshia Knight-Pulliam, Nicole Eggert (Summer Quinn from Baywatch), comedian Louis Anderson and other publicity-starved lesser-knowns. No word on if Brent Musburger will call the play by play. With all the talk about Manti Te’o’s fake girlfriend and Lance Armstrong’s stint with Oprah, don’t forget Championship Sunday. Digital First Media helps you predict the outcome with an interactive chart that lets you weigh factors such as home field, turnover, pass offense, rush defense and more. You won’t find something like this anywhere else. It’s based on playoff statistics dating back 40 years. It’s also fun and slightly addictive. The San Francisco 49ers play at the Atlanta Falcons at 3 p.m. Sunday for the NFC Championship. Followed by the Baltimore Ravens at the New England Patriots at 6:30 p.m. Veteran wide receiver Devin Thomas, who retired in August, is back and has signed a reserve/futures contract with the Detroit Lions. Thomas played at Michigan State and was drafted in the second round of the 2008 draft by the Washington Redskins. After spending three seasons with the Redskins, he played for the Carolina Panthers (2010) and the New York Giants (2010-11). He won a Super Bowl ring with the Giants team a year ago and played a key role in the NFL Championship game when he recovered two fumbles, one in overtime that set up the winning score to take the Giants to the Super Bowl. He signed with the Chicago Bears as a free agent in May 2012 and announced his retirement on Aug. 5, 2012. Thomas, who played at Canton High School, will fight for a spot on the roster as a wide receiver or special teams player. Outside linebacker Jarvis Jones is Mel Kiper’s Lions’ pick at No. 5 overall in his first mock draft. It’s early in the process and Jones, an excellent pass rusher, has a past neck injury that could change everything. However, I’m all for taking him with the fifth overall pick for one reason — he sacks, he doesn’t dance. And the Georgia linebacker sacks a lot — 14.5 last season to lead the nation. “He brings a workmanlike effort and will sack quarterbacks, and skip the dance as he helps them up,’’ Kiper wrote in his mock draft notes on Jones. It makes me crazy when current Lions like Ndamukong Suh and Nick Fairley dance and celebrate like they’d won the Super Bowl when they get a sack — even if the Lions are down and out of the game. Sacks are a big deal and the sack dances are tolerable when the Lions hold a lead. But when they are woefully behind, I think they are inappropriate. If Kiper is right on this, score one for Jarvis Jones. When Mel Kiper speaks, draftniks listen. The ESPN draft analyst released his first mock draft on Wednesday. He has the Detroit Lions picking outside linebacker Jarvis Jones out of Georgia with the fifth overall pick. Even though it’s early — the draft starts April 25 — it seems that cornerback Dee Milliner out of Alabama might be a better pick for Detroit, but Kiper has him going at fourth to the Eagles. “At linebacker you could use Jones like a Von Miller has been used in Denver. It doesn’t have to be the 3-4 outside linebacker spot, that was kind of a misnomer. ... You see what Von Miller means for that defense in Denver,’’ Kiper said in a conference call on Wednesday. Jones played at USC as a freshman and suffered a neck injury that was diagnosed as spinal stenosis and the USC doctors would not clear him to play so he transferred to Georgia where he was cleared by doctors and played two seasons. Jones had 12.5 sacks in the 2012 season and two more in the Capital One Bowl. In his two seasons at Georgia, he had 28 sacks, 155 total tackles, 44 tackles for loss, nine forced fumbles, and one interception. Don Muhlbach, long-time Detroit Lions long-snapper will represent Detroit at the Pro Bowl on Jan. 27 in Hawaii. 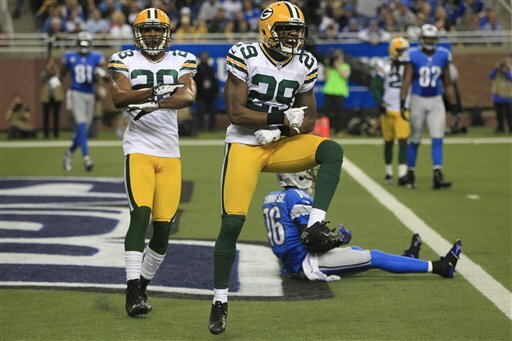 He was named to the NFC team on Tuesday by Green Bay Packers coach Mike McCarthy who will coach the NFC squad. Muhlbach was signed by the Lions in November 2004 and has been on the roster ever since. He is an unrestricted free agent. Muhlbach was instrumental when Hanson broke the team’s all-time single-season scoring record in 2012. He snapped for 32 field goals and 38 PATs. Muhlbach proved valuable when Hanson connected on 18 40-plus yard field goals, the second-highest single-season total in NFL history. He is the first-ever Lions specialist who did not kick, punt or return to play special teams in the Pro Bowl. Earlier on Tuesday, Calvin Johnson announced he wouldn’t play in the Pro Bowl. He dealt with a knee injury throughout the season. It is no surprise the Detroit Lions wide receiver Calvin Johnson won’t play in the Pro Bowl. The decision was announced Tuesday. Johnson struggled with a knee injury all season. Days after the season ended GM Martin Mayhew said the team was monitoring the situation, but expected that rest would be the best medicine for Johnson’s knee. Mayhew and others have suggested Johnson was dealing with more severe injuries than he ever let on throughout the season. Johnson routinely missed practices, resting his body for Sundays. Despite that he broke the all-time single-season receiving yards record, finishing with 1,964 yards. Last year it was the same situation. He was voted to the Pro Bowl, but did not play due to injuries. He still went to Hawaii for the Pro Bowl festivities and picked up the tab for the rest of his wide receiver teammates to join him. Tampa Bay wide receiver Vincent Jackson is expected to take Johnson’s place. After the Detroit Lions 4-12 season, there was no doubt changes would be made. On Monday, the team announced that special teams coordinator Danny Crossman will not return. There was no official word on his departure, but reportedly he asked out of his contract so he could coach with his friend Doug Marrone at Buffalo. The Lions also hired two assistants and moved two others. Curtis Modkins will coach the running backs. Modkins was let go from the Buffalo Bills at the end of the season along with the rest of the coaching staff. For the past three seasons in Buffalo he was offensive coordinator/running backs coach although Chan Gailey called the plays. Modkins was instrumental in developing Fred Jackson and C.J. Spiller. The Bills averaged 4.7 yards per attempt over those three seasons, the fourth best rushing average in the NFL. Bobby Johnson has been named the tight ends coach. He most recently held the same position with the Jacksonville Jaquars. In 2010-2011 he was the assistant offensive line coach for the Bills. This will be Johnson’s fourth NFL season after spending 15 seasons at the collegiate ranks. Tim Lappano, who has been the Lions tight ends coach for the past four seasons, will now coach the wide receivers. This will be his 31st season as a coach and his eighth in the NFL. Jeremiah Washburn, who was a Lions’ assistant offensive line coach for the past four seasons, was promoted to offensive line coach. Shortly after the 4-12 season the Lions did not renew the contracts of Sam Gash, running backs coach; Shawn Jefferson, wide receivers coach; and offensive line coach George Yarno.